Satellite Images Indicate Mass Graves In Burundi, Amnesty Says : The Two-Way Security forces killed scores of people in Burundi in December. Now Amnesty International says images suggest that victims were buried in mass graves, possibly to cover up the extent of the killings. 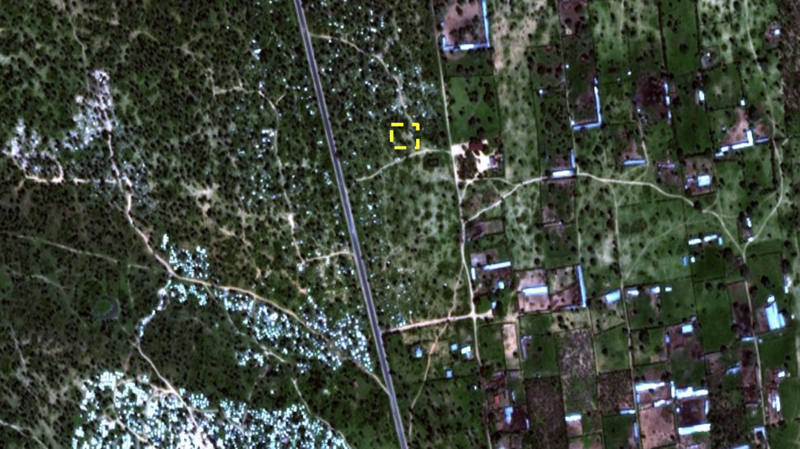 After comparing satellite images before and after Dec. 11 with video footage, Amnesty International has described the area shown in the yellow dotted line as a suspected mass grave site. A wave of violence in Burundi last December resulted in the deaths of scores of people. Now Amnesty International says satellite images and video footage indicate that dozens of people killed by police were buried in mass graves. "These images suggest a deliberate effort by the authorities to cover up the extent of the killings by their security forces," Muthoni Wanyeki, Amnesty International's Regional Director for East Africa, the Horn and the Great Lakes, said, according to an an Amnesty statement. The satellite images (which you can view on an interactive map) show mass graves in Buringa, on the outskirts of Bujumbura, where residents say at least 21 people were killed on December 11. The human rights group says they also have credible reports of mass graves in Mpanda with at least 25 bodies, and Kanyosha with 28 bodies, killed on the same day. "It is not known how many bodies might be found at other sites," the group says. "Amnesty International researchers were in Bujumbura when the killings occurred and visited affected neighborhoods, including Nyakabiga, the next morning. Residents described how the bodies of at least 21 men were left in the streets, homes and drainage ditches. 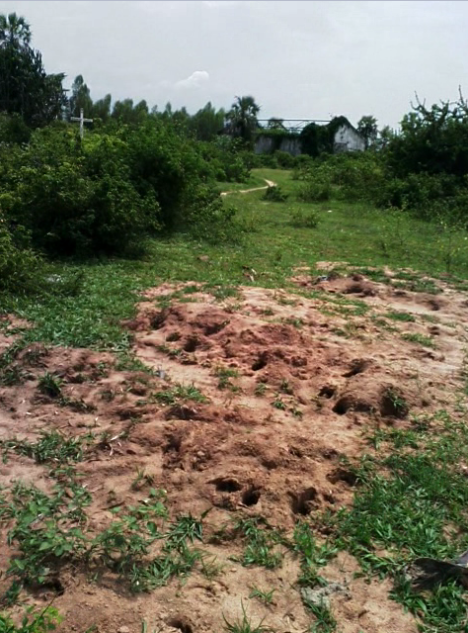 Researchers found large pools of blood where some of the victims had been killed but the bodies had been removed. "Witnesses described how police and local officials scoured Nyakabiga and other neighborhoods to retrieve the bodies of those who were killed and took them to undisclosed locations. "The mother of a 15-year-old boy who was shot in the head as he ran to take refuge in an outhouse in the Musaga neighborhood, told Amnesty International that a pickup truck from the mayor's office retrieved her son's body. The men that took him refused to tell her where the body was being taken. 'I don't know where he is or if he's been buried,' she said." The week after the attacks, NPR's Gregory Warner described the violence on Morning Edition. He said that on Dec. 11, gunmen attacked three military bases in Burundi's capital. Police responded by indiscriminately targeting Burundians who were not pro-government — pulling scores of people from their houses and shooting them. Conflict has been escalating in the central African nation since last spring, when President Pierre Nkurunziza announced he would seek a third term, despite the constitution's two-term limit. He then survived a coup attempt, and won a disputed election. The rising tensions led more than 100,000 people to flee Burundi and raised fears about the nation's future, as Gregory reported last summer. "The lines of division right now are really not ethnic; they are political. And what is going on is that you have an elected president that's done precious little for his country — the president cares more about the building his soccer team than jobs or healthcare — and the president has now seized a third term in power, really rigging the court to absolve him of constitutional two-term limits. He's cracked down brutally on peaceful expressions of dissent, and that dissent has now become armed. It's become violent." He also analyzed the possible repercussions outside of Burundi — and one explanation for why authorities might have tried to minimize the apparent scale of the killings. "Thousands of Burundian troops are serving as peacekeepers in Somalia and other African hotspots ... A crisis in this tiny country of Burundi can actually affect international security and troop deployment in the war on terror. And yet even in this interconnected world, Burundi's leadership is still acting like they're too tiny, too strategically unimportant to be noticed. And the government's approach seems to be that they can just keep the death toll low enough — they can avoid that G word, genocide — then no one will stand in their way."